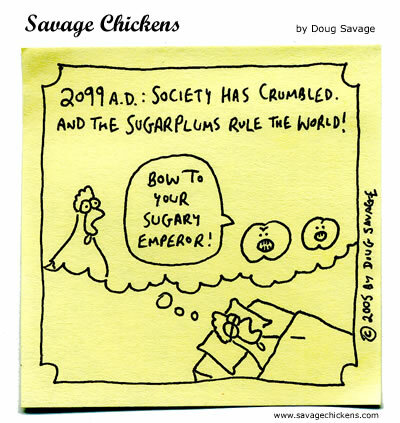 There is no emperor but the Emperor of Sugar Plums (who needs ice cream anyway)! All hail our sugarplum masters! Ok, that was so funny I jut went through the process of signing up with blogger just so I could comment and tell you how funny it was. Let’s nip this insurrection in the bud. Death to all Sugarplums. Onward to Vermont and victory. Are you with me? Shouldn’t we be dancing or something? I don’t know what’s scarier: robots taking over the world, or sugar plums taking over the world. Will people with a high blood sugar level be the first to fall? Using a meat grinder or a food processor, grind the fruit and nuts and mix well. Work into the mixture as much confectioners’ sugar as it takes to form 1-inch balls. Roll in granulated sugar, then place on a rack to dry for 24 hours. What I want to know is why there are NO PLUMS in sugarplums?